WIN! One of THREE Goody Bags filled with the fab ANIAN skincare range! I’ve been so impressed with new-to-Ireland Spanish brand ANIAN that no less than two of their products made it into last month’s MetroHerald column. Now some of you lovely lot can try it for yourselves as goody bags full of lovely skincare will be winging their way to no less than three of you. Due to the weight of these prizes, this one is only open on the island of Ireland - but I do have an international giveaway coming soon, so keep an eye out for that. And if you're quick, you can still enter my YouTube giveaway which closes tomorrow, but is open worldwide! 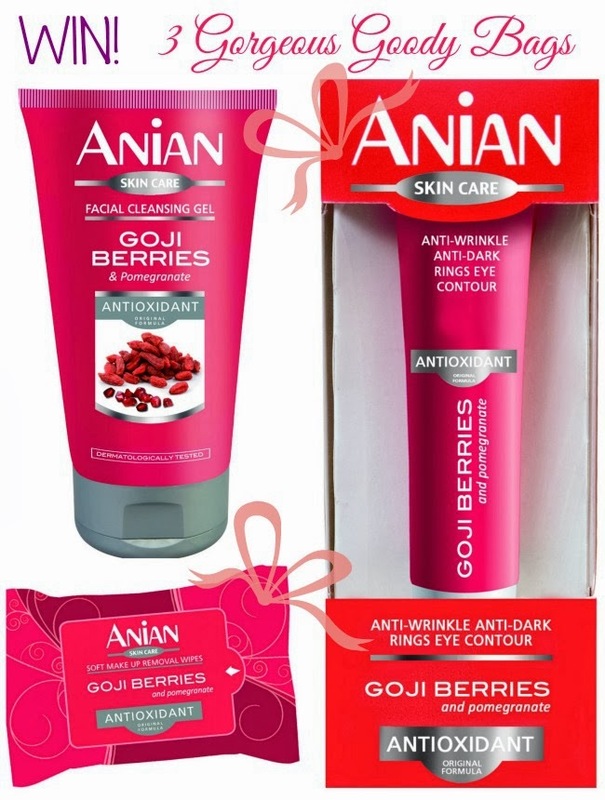 With winter fully in force this is a great time to try out the ANIAN range – all products contain the amazing superfoods Goji Berries and Pomegranates, which have been proven to dramatically improve the elasticity and firmness of your skin. Products include a body milk, moisturising cream and soothing anti-wrinkle eye cream (my personal favourite) and you can find the range in chemists nationwide. To be in with a chance to win just pop your details into the widget below. Good luck everyone! This stuff looks good enough to eat!!! another fab giveaway..you are so good! I haven't seen this stuff in chemist yet, but I on a perpetual hunt for a good eye cream - could this be the one? Great giveaway Emma, and I'm only dying to try out Anian skincare and haircare- I've wishlisted the heat protectant spray you mentioned in one of your most recent vids. I could so do with the eye contour cream! the packaging is fab isn't it?! I could use some extra power! Me please! It looks fab! You really do spoil us with these competitions! Fabulous giveaway! Good luck everybody! Mmm love a bit of Goki berry!